MS outlook now becomes a leading email client worldwide without this application one cannot imagine an organization to work fluently. This application automates the lives of many people working in an organization or as an individual by providing a wide range of functionalities like sending or receiving emails, managing contacts, and keep track of tasks and scheduling meeting and much more than that. But Working of MS outlook efficiently will merely depend upon its data files (OST and PST files). And these data files are highly prone to get damaged or corrupted. Many people may face the following error when they open MS outlook “The file C:\Documents and Settings\ Local Settings\Application Data\Microsoft\Outlook\outlook.ost is not a personal folders file.” Here we are going to discuss possible reasons and its precise solution for the above-stated error. When you upgrade to office 2007, MS Outlook may prompt error like “ost is not a personal folders file outlook 2007” as Outlook 2007 has some flaws always with OST file if proper upgradation is not performed. Update of antivirus and firewall software’s as these application done a complete scan of your system file, therefore, they may interrupt the OST file functioning. Corruption of OST file is also a major cause for this error due to oversized OST file or virus attack. Inaccessibility of OST file by MS outlook. OST file may be checked as Read-only. If your exchange mailbox account has been accidentally deleted from Exchange server or MS Outlook. To deal with outlook.ost is not a personal folders file error, Try to implement given solutions. It is a possibility that OST file that you want to open is set as Read-only File and due to which you are not able to edit or even access them. You can ensure that OST file attribute is not checked as read-only by Right clicking on OST file and selecting properties. If you acknowledge that your Outlook OST file got damaged or corrupted, Microsoft recommends using inbuilt Inbox Repair tool (scanost.exe). Scanost.exe is the inbuilt utility that can repair Offline OST file to some extent. But there is always a risk of data loss in performing the procedure as bad header files may get deleted. Also, the utility can only handle minor corruption issue and need some technical assistance to perform the complete fixing procedure. You can refer to this solution when above two methods failed to troubleshoot your problem. You can recreate new Outlook OST file to get rid of the damaged Offline file. To this, you need to rename your old OST file as xyz.oldost. Now when you start Outlook next time a new OST file will be created. 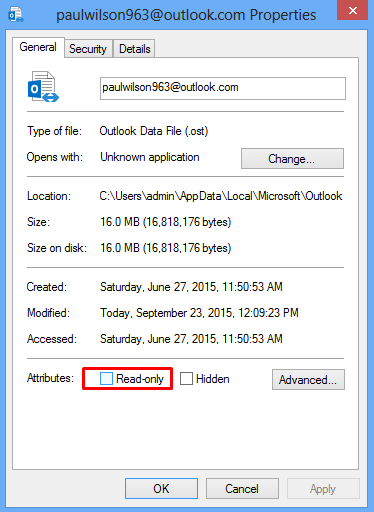 The above-discussed methods may not be able to resolve the “Outlook OST is Not a Personal Folder File” Error. And an alternative approach of using an OST recovery tool is preferred in this situation. As Scanost.exe is only used for resolving minor file corruption and is applicable with Outlook 2007 and below versions. While using a professional tool is more apt for fixing the error efficiently and effortlessly.